The late 1960s was the psychedelic era. 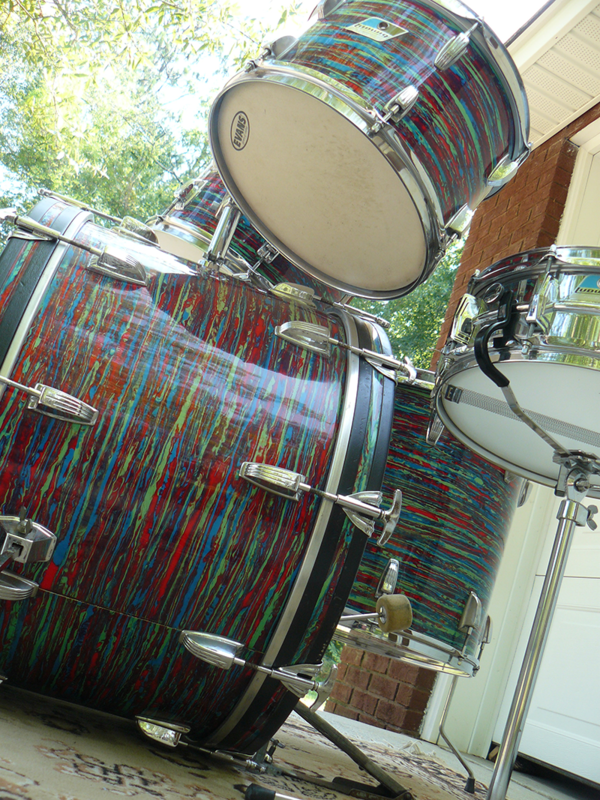 Without trying to explain what psychedelic means I will just present the finish on this drum set to illustrate it. Wild and weird colors became part of what it was all about. 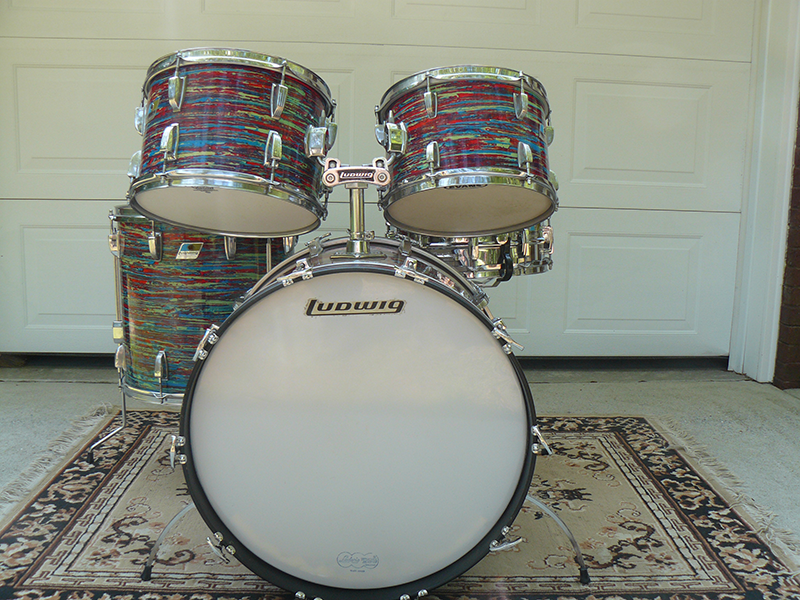 Ludwig Drum Company produced three drum finishes that were truly wild and weird looking. The three were Psychedelic Red, Mod Orange, and Citrus Mod. 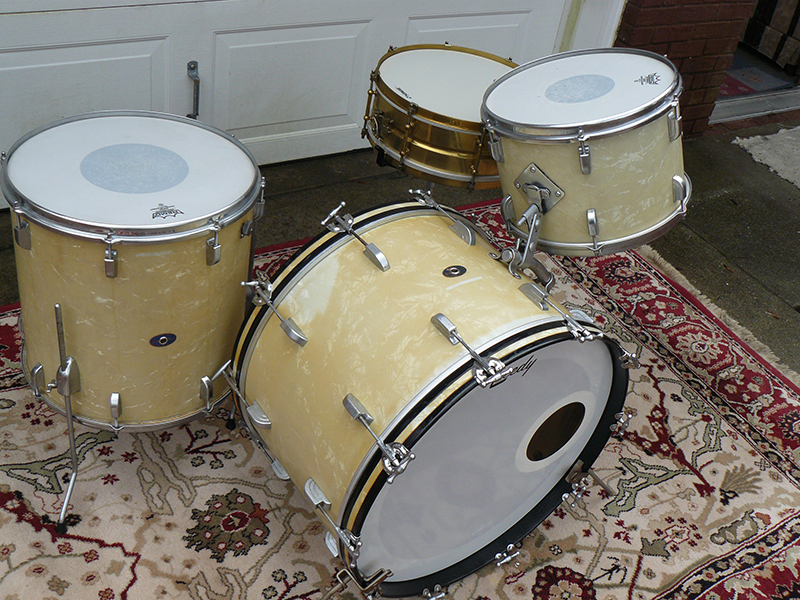 This kit is a good example of Citrus Mod, the rarest of the three finishes. 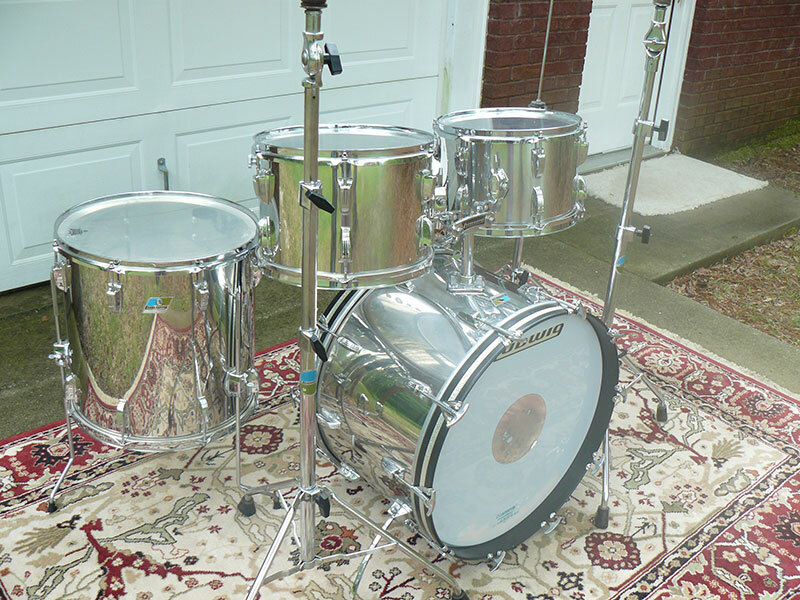 "Slingerland shells reached a new low in the early 1980s when they actually sold drums which were little more than cardboard tubes with pearl covering and some hardware slapped on. The tubes were sturdier than the mailing-tube type, as they were actually made from Sonatube. (Sonatube is used for telescopes and as forms for casting concrete pillars.) The basic material was nevertheless cardboard, and the bearing edges quickly lost their integrity." It's December and all I can say is, "where did the year go?" I can remember when I was young how it seemed like Christmas would never come. Now, it seems like the years are flying by. One thing never changes, when it gets Christmas time all the kids start thinking about getting some new toys. Even though I have joined the senior citizens rank, I like getting new toys myself. 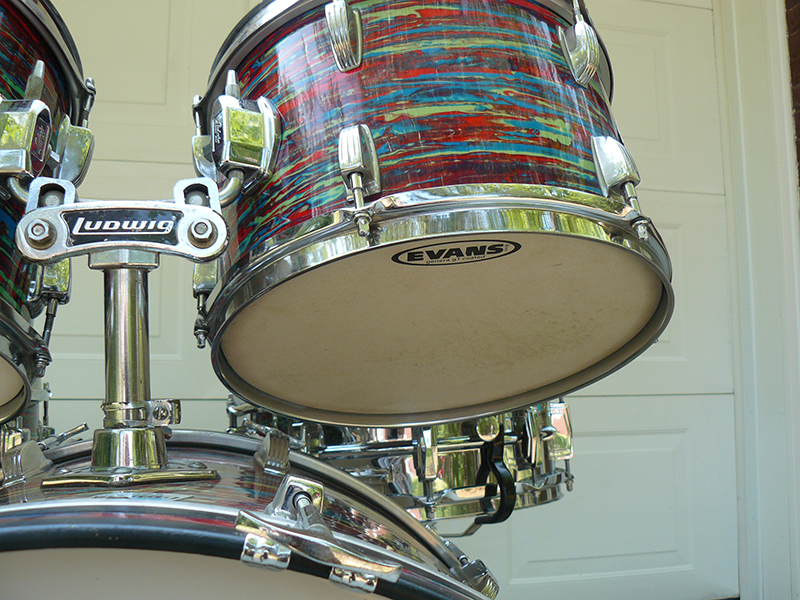 The drum from my collection I am featuring this month is sort of a toy drum. 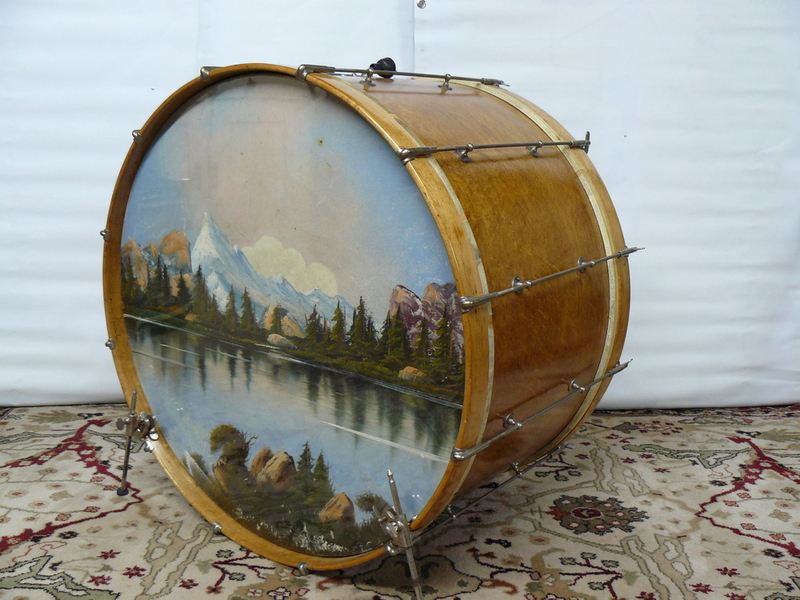 This Mastro snare drum was offered to the public as more than a toy and not quite a student musical instrument. It was another effort to supply young people, who had been influenced by The Beatles, with an affordable instrument. I have said it before, after The Beatles played on The Ed Sullivan Show, almost every young person wanted to play an instrument. 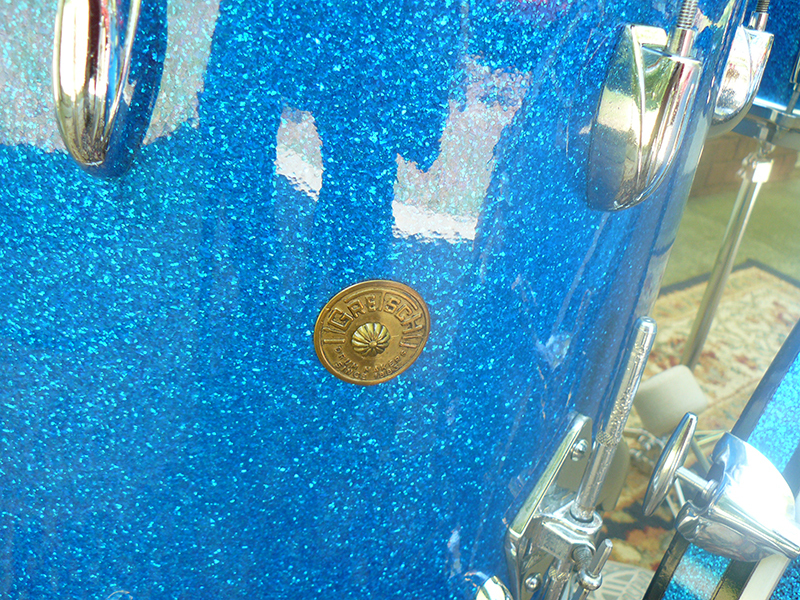 The Mastro drum even had a connection with the Beatles. 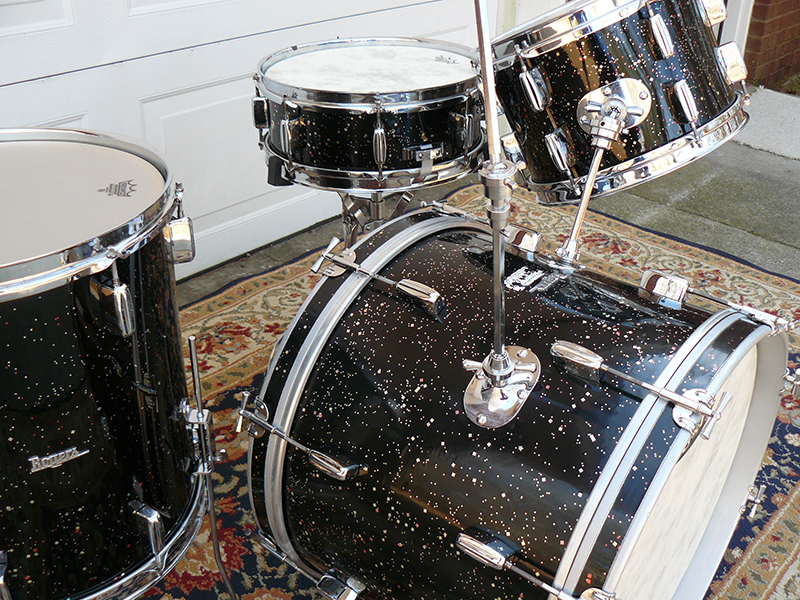 Slingerland drums are very cool drums. The set I am showing you this month was owned by the original owner since they were brand new, and I fell in love with this five piece set the first time I saw them. 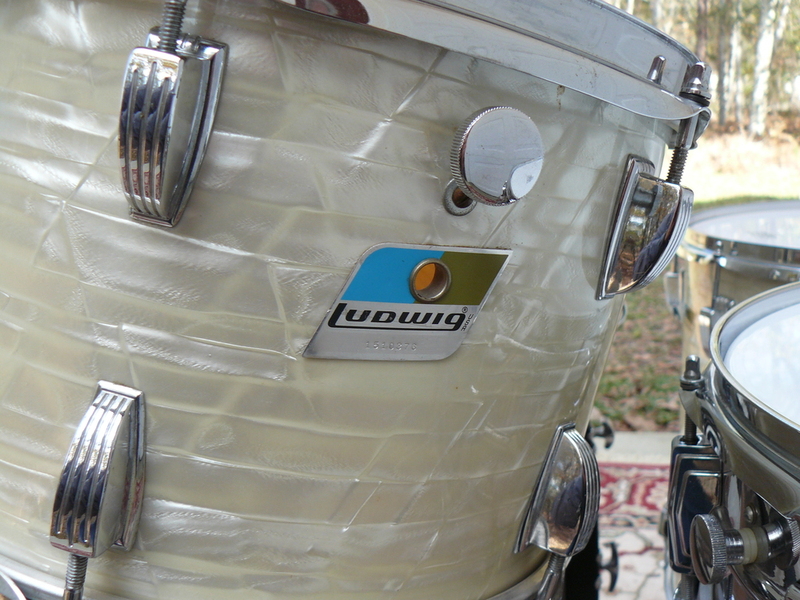 The Ludwig set I'm showing you from my collection is a real beauty. This is a very niceLudwig Super Beat set. I am not totally sure who started calling this configuration "Super Beat" but I like it. 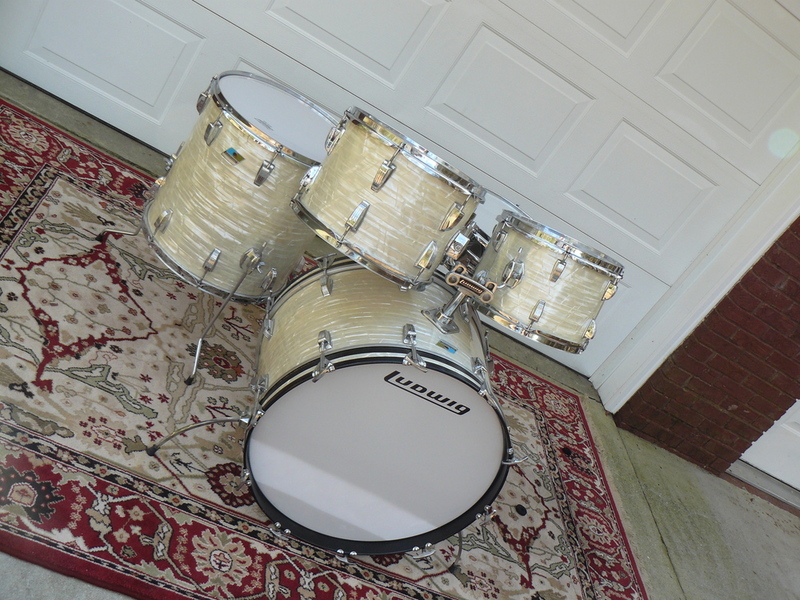 The set is a Super Classic set with a 20X14 bass drum. 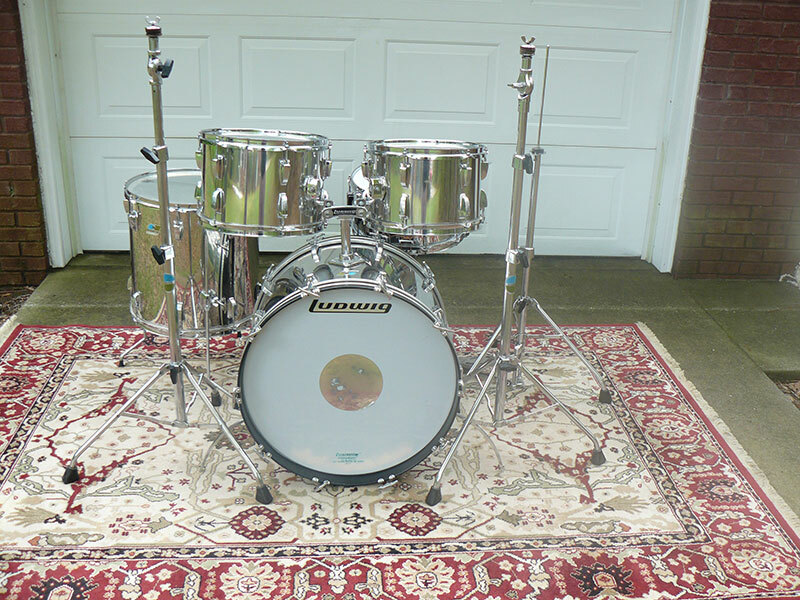 Since it has a 20X14 like the "Downbeat" and 16X16 and 13X9 toms like a "Super Classic" the collectors have named these sets "Super Beat". I want to feature a 1960s Zim Gar stencil set from my collection this month. Most of you know these sets were made in Japan. 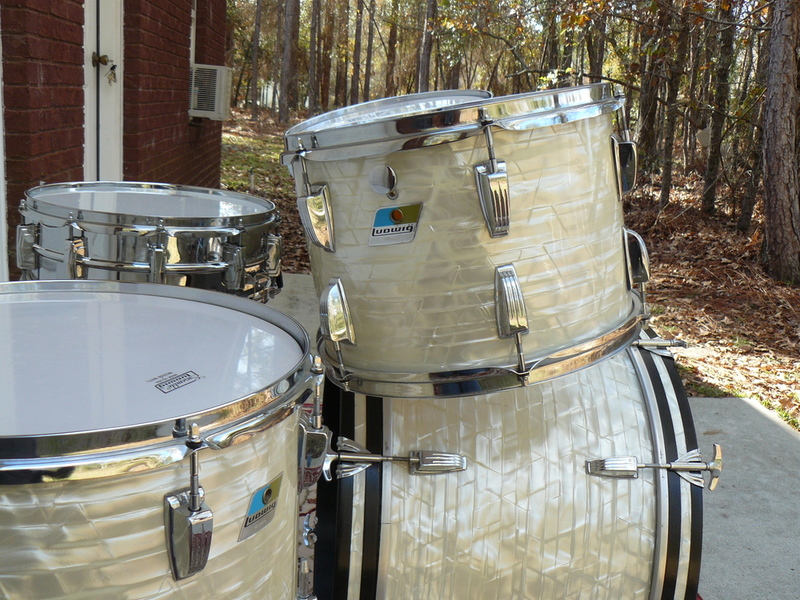 Sometimes you will see them listed as MIJ drums. 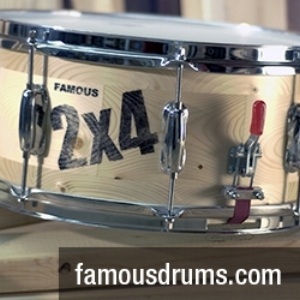 They were made at the Pearl and Star (Tama) factories and imported in to the United States as a cheaper alternative to the great American drums. This set is a beautiful blue glass glitter finish that has developed a texture. They are not smooth to the touch. It is uniform over the complete set. I would like one of the Rogers experts to shed some light on this mystery for me. The paper labels inside indicate that these are Cleveland Holiday models. The solid grey interiors indicates that these are early 1960s. I have been told the Cleveland and the Dayton models were both made at Covington. Production was later moved to Fullerton. 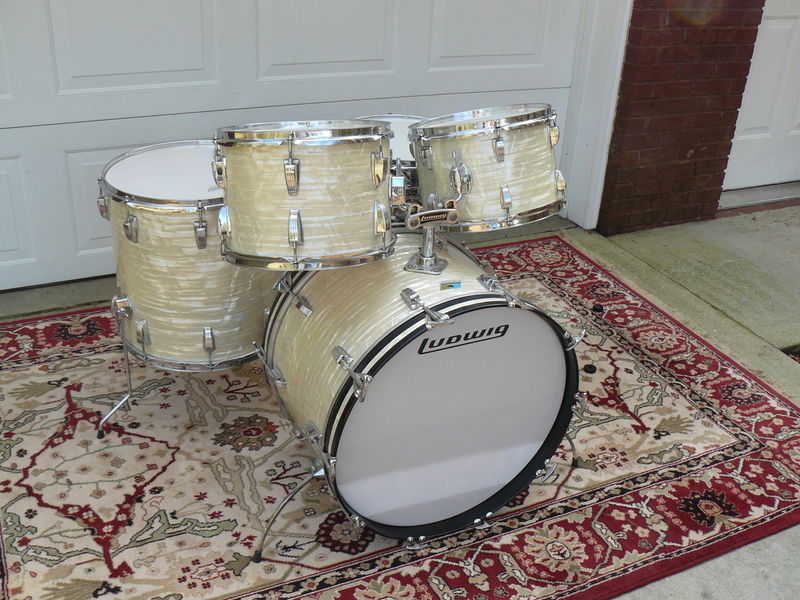 The drum set from my collection that I want to feature this month is a 1960s Ludwig Downbeat Set in sparkling pink champagne pearl. 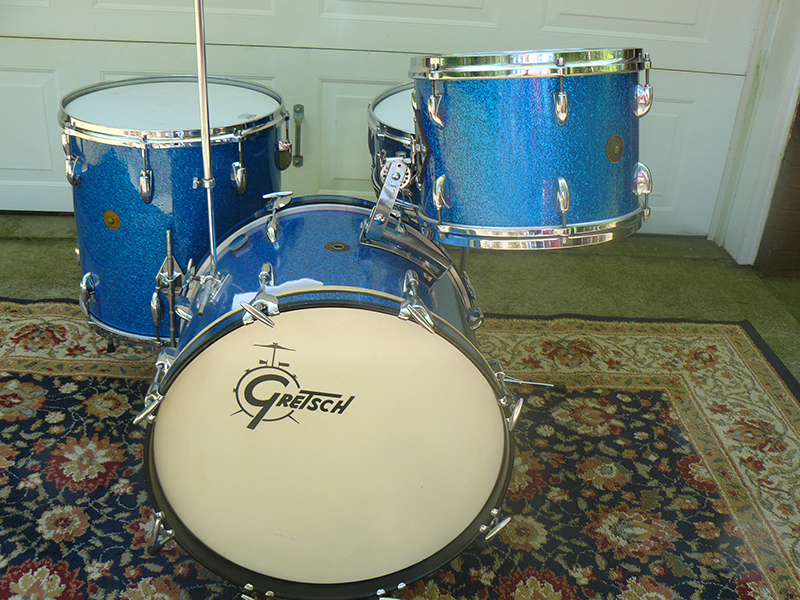 Downbeat sets began in 1959. It is one of my all time favorite kits. 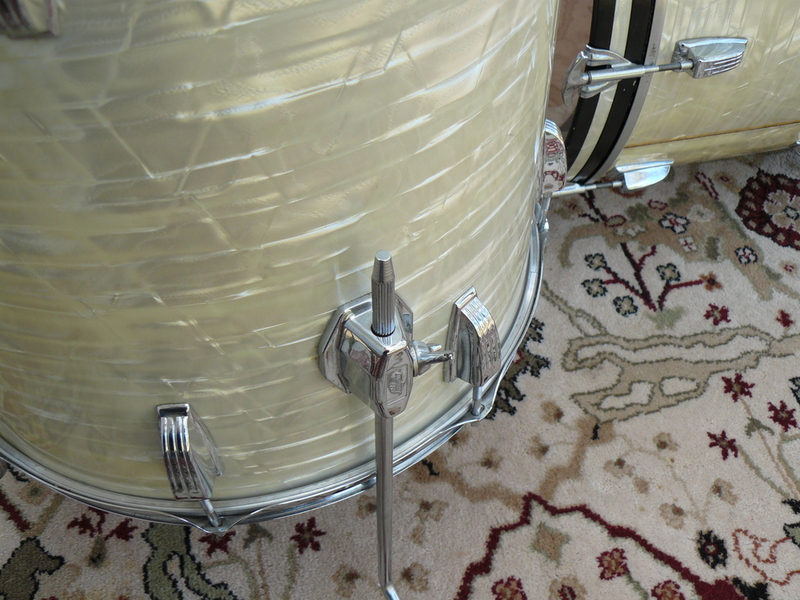 I really love these drums for many reasons. Their sizes are one reason I love them. 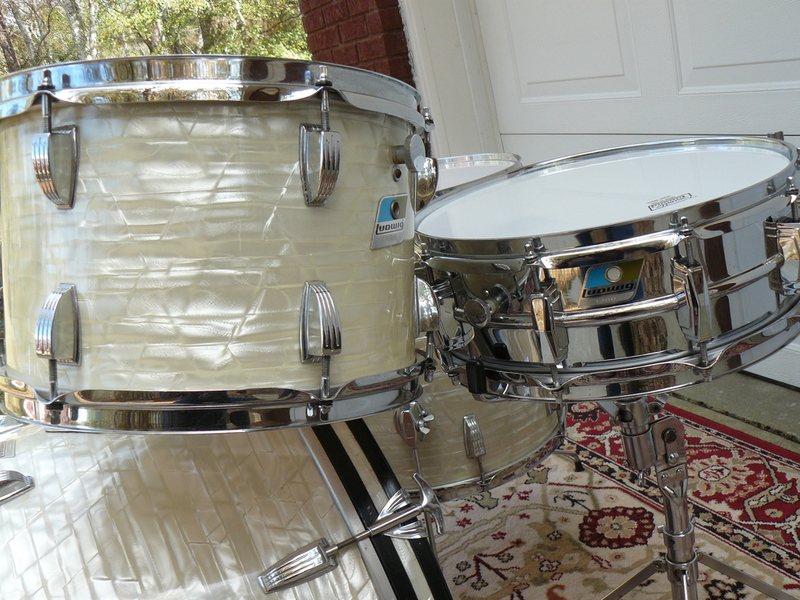 These are the size drums Ringo Starr played on the earlier Ed Sullivan shows. 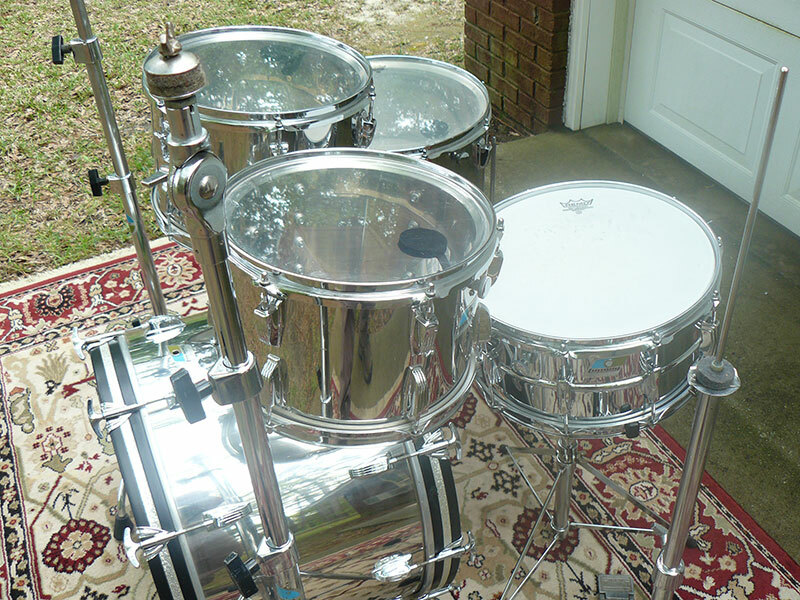 The Bass drum is 20"X14", the floor tom is 14"X14" and the mounted tom is 12''X8". 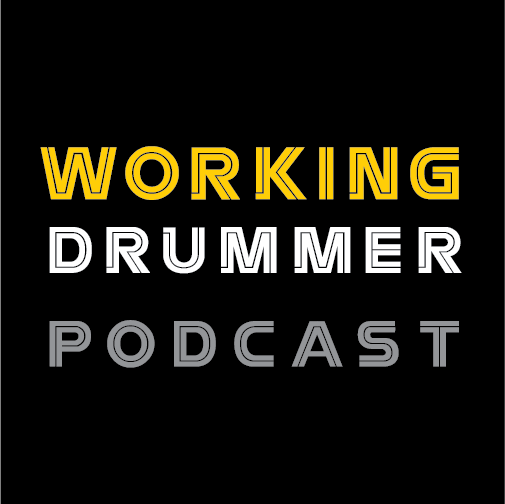 Ringo referred to the Downbeat sets he owned as the "mini" kits. 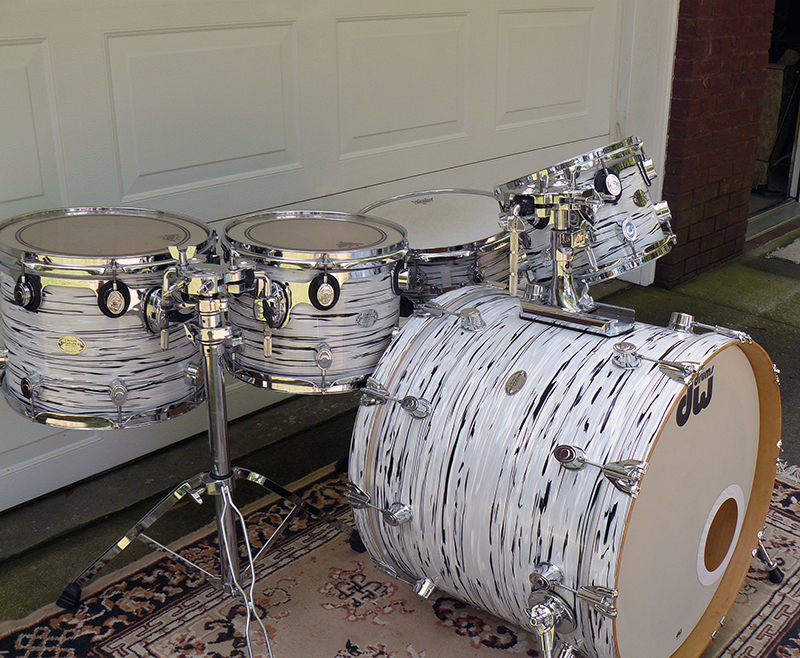 I used to have a hard time telling if a kit was a Downbeat set in photos, but I learned to count the bass drum T- rods. 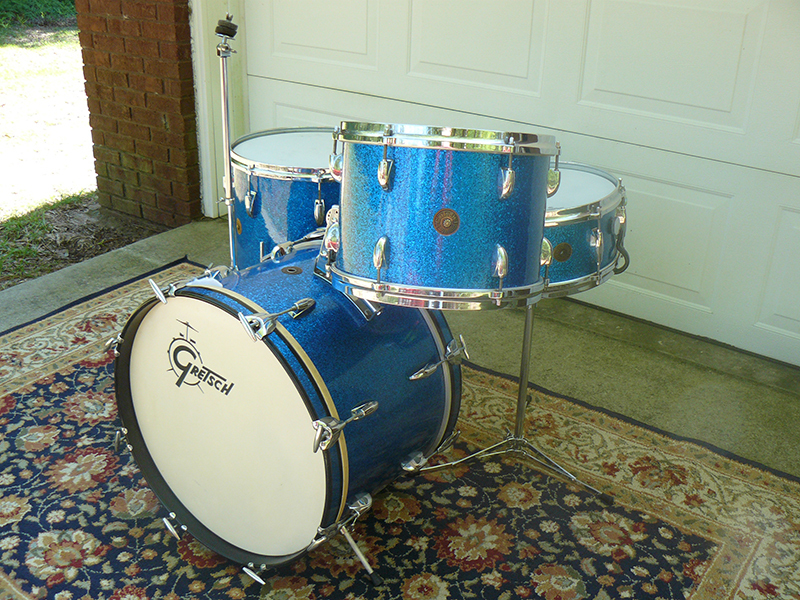 The Downbeat set has 8 lugs and the 22"X14" Super Classics have 10 lugs. 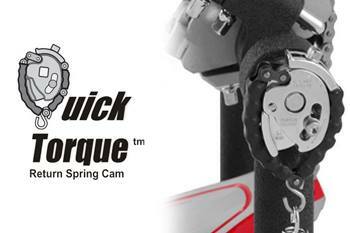 Another way to tell is to look at the lugs on the mounted tom. 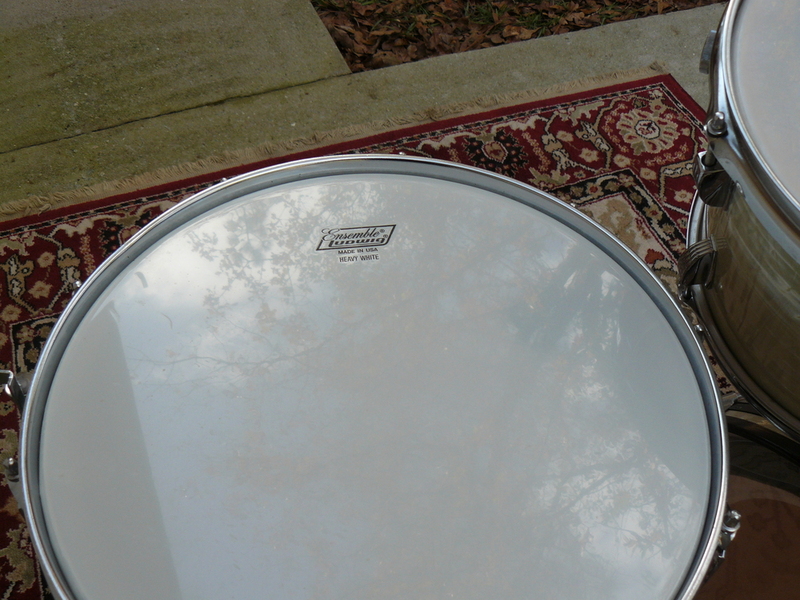 The space is greater between the top and bottom lugs on the 12'' tom than the space on the 13" tom. 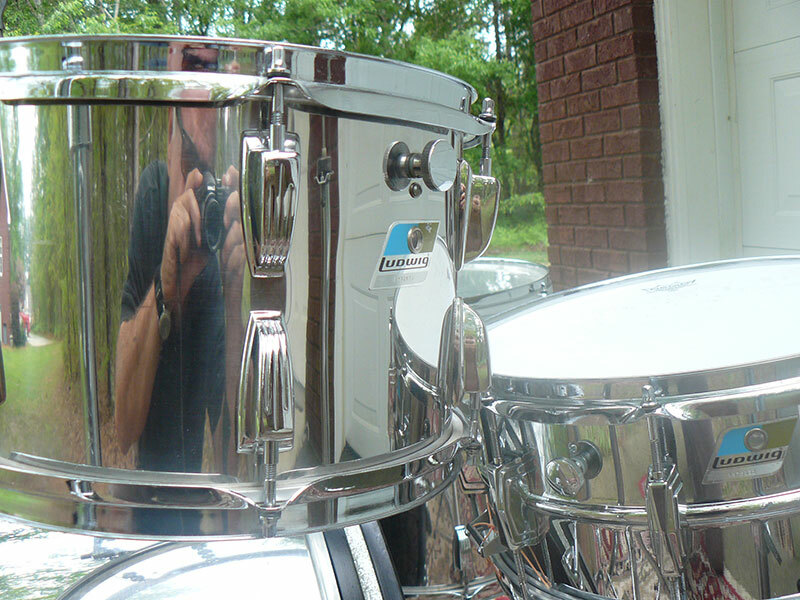 The 13" tom used on the Super Classics has larger lugs, so the space between them is smaller.